What is the customs process in Japan to import? How is import cargo released from Japan Customs to importer? Who are the parties involved in import customs clearance formalities in Japan? Import cargo clearance in Japan Customs. 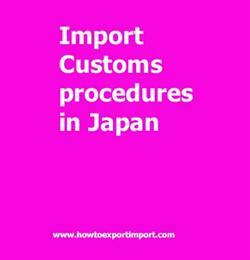 The information provided here details on how to import goods to Japan especially import customs clearance procedures in Japan. Japan Customs under the Ministry of Finance is the official authority responsible for regulates inflow and outflow of goods in Japan, levies taxes on goods efficiently, implementation of customs policies, facilitate legitimate trade and protection of the society and legal economic activities. We have already mentioned that any person wishing to import goods must declare them to the Director-General of Customs and obtain an import permit after necessary examination of the goods concerned. Declaration must be made by lodging an import (Customs duty payment) declaration describing the quantity and value of goods as well as any other required particulars. Under the "immediate import permission system upon arrival", import authorization might be conceded when cargo entry is affirmed. To be qualified for this framework, importers must file a preliminary declaration online. Import customs procedures required in CHIBA. Import Customs process in HACHINOHE . Process to import to HAKATA. Requirements of customs to import to HIROSHIMA. Customs requirements in HITACHI to import. Customs needed to import to IMABARI. How can I clear customs to import in IWAKI. What Customs formalities required to import in KAGOSHIMA. What should I do to import goods in MIZUSHIMA. How to get import customs permission in MOJI. Procedure to get customs clearance to import in KOBE. Mandatory process need to complete import in NAGOYA The way to get customs clearance process to import in HIKOU.